I have just released two versions of RelStorage. Version 1.3.0b1 adds full support for ZODB blobs stored on the filesystem. Version 1.2.0 is currently the better choice if you’re upgrading a production system and don’t need blob support. People have been asking for blob support for months. I am glad to finally get it done, with a little help from a customer. With blob support, now we can easily store large artifacts on the filesystem, while keeping all metadata in the database. P.S. I have been told that a very prominent Plone developer recently configured RelStorage with master/slave replication on MySQL, and that it works smoothly. I expect him to announce his success soon! 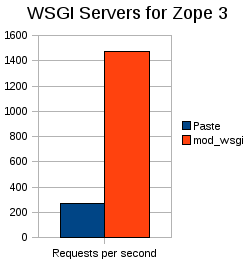 I have been planning to compare mod_wsgi with paste.httpserver, which Zope 3 uses by default. I guessed the improvement would be small since parsing HTTP isn’t exactly computationally intensive. Today I finally had a good chance to perform the test on a new linode virtual host. The requests are directed at a simple Zope page template with no dynamic content (yet), but the Zope publisher, security, and component architecture are all deeply involved. The Paste HTTP server handles up to 276 requests per second, while a simple configuration of mod_wsgi handles up to 1476 per second. Apparently, Graham‘s beautiful Apache module is over 5 times as fast for this workload. Amazing! Well, admittedly, no… it’s not actually amazing. I ran this test on a Xen guest that has access to 4 cores. I configured mod_wsgi to run 4 processes, each with 1 thread. This mod_wsgi configuration has no lock contention. The Paste HTTP server lets you run multiple threads, but not multiple processes, leading to enormous contention for Python’s global interpreter lock. The Paste HTTP server is easier to get running, but it’s clearly not intended to compete with the likes of mod_wsgi for production use. This script is mostly trivial, except that it modifies the PATH_INFO variable to map the root URL to a folder inside Zope. I’m sure the same path translation is possible with Apache rewrite rules, but this way is easier, I think. I’m starting to get a sense of what publisher functionality I can put in a WSGI pipeline and what I shouldn’t. The pipeline is very useful for specifying the order things should happen. For example, the error handling should be as early in the pipeline as possible, so it can handle many kinds of errors, but it has to come after the pipeline element that opens and closes the root database connection. Constraints like that have never been expressed clearly in the current publisher. Split the base tag handling between a pipeline element and a new adapter. Add short-lived output filter hooks to the response, similar to the traversal_hooks I added to requests, which I think turned out quite nice. Stick to the original plan, which might cause performance problems since Zope would then have to buffer potentially large output streams. I need to choose the pattern that maximizes clarity for readers. #1 and #2 are very similar. #1 is less direct and thus more ambiguous than #2, but #1 is used more often in Zope code.